One of the things you're going to hear in the blogging & online business world over and over again is that you need to be on Pinterest. Pinterest isn’t just an easy way to plan a wedding or find crafts for birthday parties - it’s actually one of the top ways to grow your traffic, email list, and income! Your profile is the first thing you should set up when you start using Pinterest or the first thing you should tackle if you’re doing an audit of your account. It is the face of your biz on Pinterest and having it filled out and in peak condition is important to make sure you’re reaching your ideal audience. 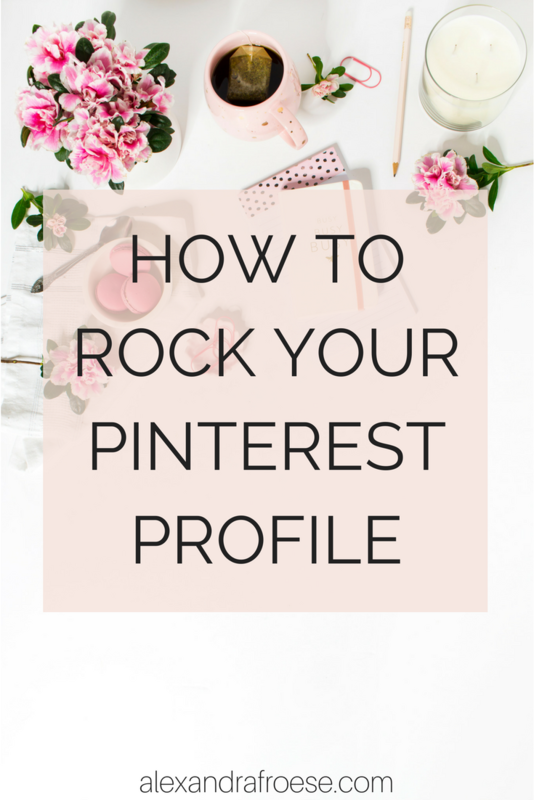 If you’re new to Pinterest or just need to do a refresh on your profile, here are the 7 steps you need to follow to rock your Pinterest profile. It may seem obvious, but this is the most important step. In order to function as a business on Pinterest, you MUST have a business account (it’s in Pinterest’s Terms & Conditions!). This option has both pros and cons. While you might get to reap the benefits of having established followers and boards, you’re also going to have to deal with making most of your boards private (your Travel blog audience probably isn’t doing too much pinning about knitting dog sweaters ;) ), and the fact that many of your followers may not be your ideal audience. Converting an account is also pretty simple. You’ll want to head over to the Pinterest for Business page, click on “sign up” in the top right-hand corner, and then click on the red “Switch to a Business” button in the popup. There! Now you have a business account. This will become your “url” on Pinterest - for example, my username is afroesesolutions, so when you visit my Pinterest profile, the URL is http://www.pinterest.ca/afroesesolutions. You have 15 characters to work with here, so if your business or blog name is longer than that, you’ll have to get a little creative. You could use your name (eg. alexandrafroese), or come up with a shorter version of your business name, like I did. As an example, let’s take a look at one of my favourite Pinterest bloggers, Krista Dickson of Blogging Beautifully. She has her business name laid out perfectly. She has her personal name (dotted underline), her blog name (wavy underline), and related keywords (zigzag underline). This will maximize the potential of her profile showing up in searches. For your profile photo, you’ll most likely want to use a friendly photo of yourself or your brand’s logo. Generally speaking, you’ll want to use a photo of yourself. It adds that little personal touch and helps users connect with you as a person. But that’s not a hard rule, and feel free to use your logo if you prefer! If you have space, include your CTA (Call To Action) at the end. BONUS TIP: You can include your location in your account settings - this adds a personal connection with your readers. If you’re uncomfortable with advertising where you live, you can simply put your state/province and country, or even just your country. Because I live in a small town, I just use my province and country. If you need more detailed instructions, check out this page for more in-depth instructions for Wordpress sites. Unfortunately, this is not an option for Etsy shop owners. Rich Pins are a must-have for business accounts, so make sure you don’t skip this step! If you follow all of these steps, your profile will be looking great in no time! Once your profile has been set up, it's the perfect time to start optimizing it with keywords! Check out my post for the low-down on using keywords on Pinterest.